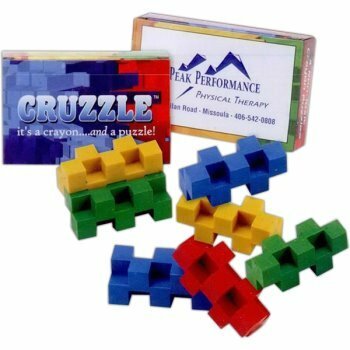 Cruzzles are a cool name for a combination crayon and puzzle. Each piece is 1 3/4" X 3/4" and each crayon box contains one each crayon of Red, Green, Blue and Yellow .The crayons are safe, non-toxic, and confirm to ASTM D-4236. Imprintable area on the back of the box is 2 3/4" X 1 1/4". Minimum order is only 250 boxes (4 crayons to a box).